Cleaned mechanically with distilled water and mended with UHU Hart (Melissa Morison, July 2005). Terracotta incense burner flanked by lampstands. Knidian product. Moldmade in four parts: hollow plinth and three hollow columnar elements, which are luted to the top of the base and the joints are smoothed over with thick brushing. 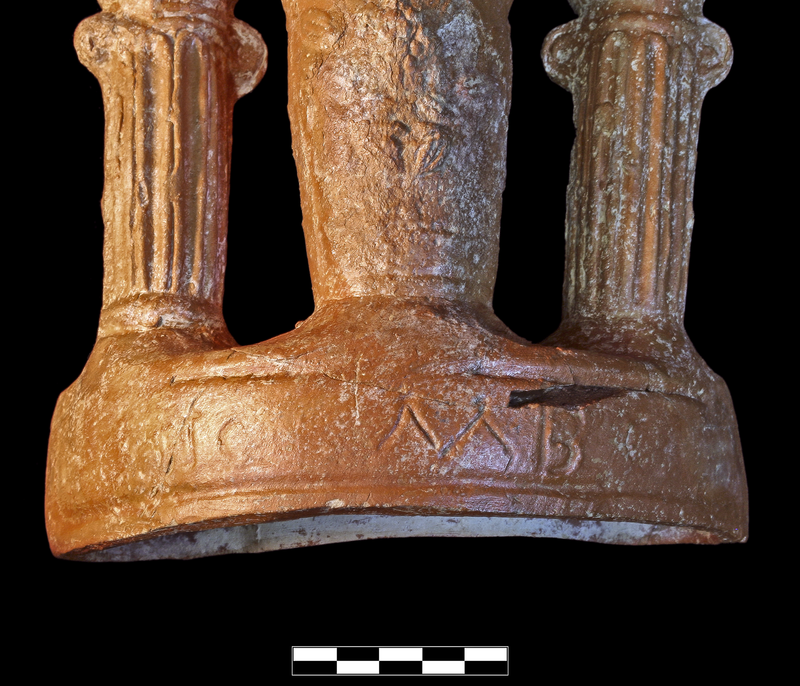 Ventilation holes in center floor of bowl of thymiaterion and two lampstands and matching ones into plinth. The base is a long, hollow, rectangular plinth that is sharply concave, bearing shallow relief decoration on the front and sides. The front shows a sunken panel divided horizontally into an upper and lower section; the lower section has a wavey band running through it. 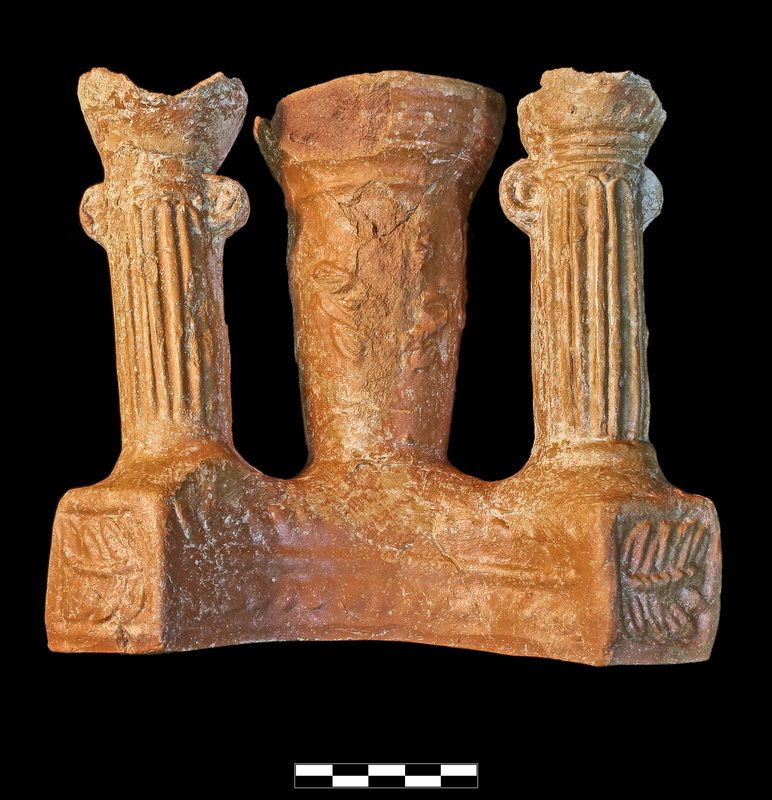 The ends or sides of the base show simple palm branch motifs with concave petals, oriented horizontally. 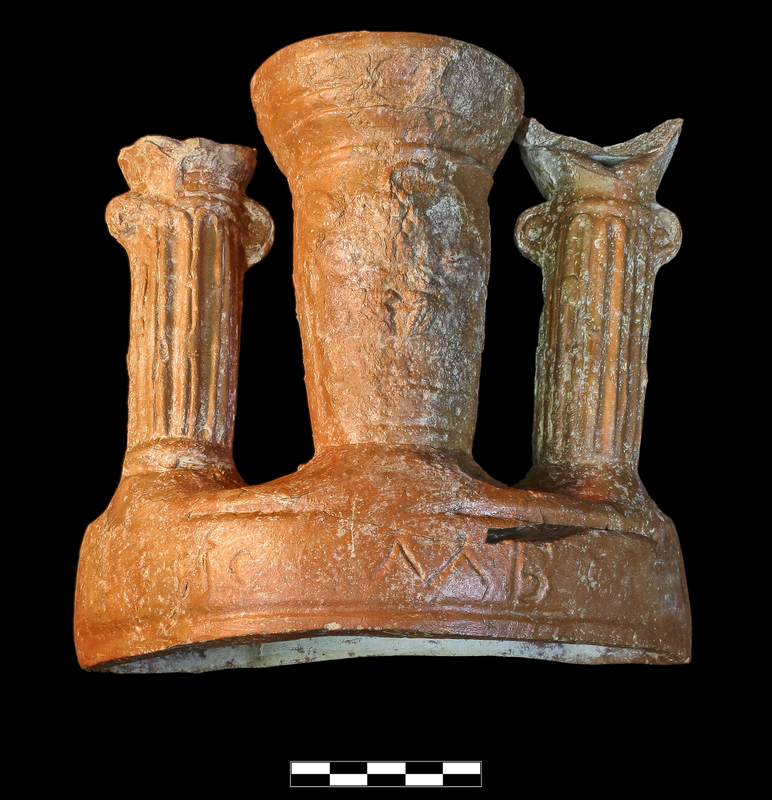 The back, convex surface has a simple sunken panel, within which is incuse text just below and right of the central stand: Θ̣Ε̣ΟΙϹ ΛΑΒΕ. Above this base, the left and right lampstands are fashioned as Ionic columns with deep, thick flutes and narrow, rounded volutes on either side at the top, but no base and no flat capital element. The central element is an altar that widens slightly up the body, showing in shallow relief bunches of grapes and garlands. This altar has a flaring capital with three grooves forming wide, deep bowl (D. 0.035 m); traces of burning all around interior. Late 1st-mid-2nd century A.D. Fabric: 10R 6/8, light red. Slip: 10R 5/6-5/8, red. Fine, hard fabric with very rare, very small, subangular(?) white (calcitic) inclusions and sparse specks of golden mica. Platy fracture but crumbly in places (where overfired?). Burning of fragment to brick-red (during firing?) around front bowl of thymiaterion. Thick, even, semi lustrous slip with slightly metallic sheen, slightly flakey around base. Nearly complete from four large fragments; the top lamps on both lampstands are broken off and the surface especially on the central altar element is chipped and flaked; and notable erosion: moisture? Thin but extensive encrustation.